Wongsarnpigoon, I. (2018). Finding the positive: Reflective observation of an advising session. 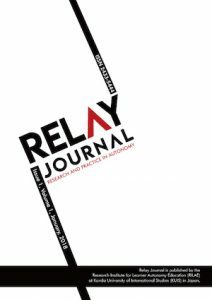 Relay Journal, 1(2), 317-329. This reflective paper contains observations on a specific advising session between a student and the author, who was in his first year as a learning advisor. During the session, particular attention was paid to the use of certain advising skills, namely empathizing and complimenting, and establishing a positive mood in the session. Following the session, the author reflected on the session and shared his observations with colleagues. The target skills were effective in prompting reflection from the student and acknowledging her positive achievements, and the session was more positive than previous ones. Observation also revealed, however, that there were other areas of the author’s advising that he could focus in the future. Finally, actions taken to act on the findings are described, along with further reflections on the author’s advising since the observation as well as how the reflection process aided his development as an advisor. Making the transition from teaching languages to language advising involves a significant change in roles and skills. Even experienced educators often find various challenges in acclimating to this transition (Morrison & Navarro, 2012). As such, for those new to the field, reflection on their evolving practices is crucial in the development of their identities as advisors. This was true in my own case, as well. I am currently in my second year as a learning advisor in the Self-Access Learning Center (SALC) at Kanda University of International Studies. Previously, I had taught English in Japanese classrooms for many years, but becoming an advisor required me to adjust to working with learners in a different way. Fortunately, my training during my first year as an advisor included the opportunity to observe and reflect on my own advising and to share my findings with my peers. This paper contains my observation of an advising session during that first year, my reflections on it, and how I applied what I found to my continuing development as a learning advisor. The advisee, Mari (a pseudonym), was in her first year of university at the time of this observation. She was taking the SALC’s Effective Learning Module 2 (ELM2), for which I was her advisor. In the previous semester, we had also worked together on a SALC module, and she had done very well. She took her learning quite seriously and always showed careful thought in her written reflections. The SALC modules are optional, one-semester, self-directed modules. Students taking ELM2 meet individually with their learning advisors four times during the semester, and this particular session was the third such meeting between myself and Mari. The purpose of the session was for the student to reflect on the previous month of their self-directed learning. This process might typically include discussing ongoing issues with her learning, evaluating her progress during the past month, or refining her learning focus. Although Mari and I had a good personal rapport, the mood in our advising sessions tended to be somewhat tense and serious. Prior to the observed session, my peer mentor and I both watched a video recording of an earlier meeting between myself and Mari, in order to identify potential areas to focus on in my observation. My mentor noted that my facial expressions and body language differed from how she had normally observed me interacting with students. I had not previously identified this as an issue when advising other students and felt that I was successful at keeping other sessions positive. My mentor and I agreed, however, that it is important to be consistent in presenting a supportive and friendly setting to every student. The serious atmosphere could be due to the weight that Mari placed on her own learning. Another factor might have been the fact that at that point, she had been somewhat dissatisfied with her self-directed learning that semester and had experienced less success in that area than in the previous semester. As a result of this overall mood, I was somewhat preoccupied thinking of the right strategies or questions to use and had experienced some difficulty maintaining a natural flow of dialogue and positive atmosphere in our previous sessions together. Following the discussion with my peer mentor, I decided on some aspects of my advising to focus on in this session: empathizing and complimenting, and more generally, maintaining a positive atmosphere in the session through, for instance, eye contact and smiling. Empathizing and complimenting are advising strategies that can be used to target affective issues. When empathizing, an advisor tries to view a situation from the student’s perspective and imagines the student’s thoughts or feelings. This action can improve the trust between the advisor and student (Kato & Mynard, 2015). Complimenting might seem self-explanatory, but in advising, it refers more specifically to giving positive comments directed at something that the advisor has noticed is meaningful. The functions of these two strategies in advising include highlighting positive achievements that the learner might not have noticed, demonstrating that the advisor is truly noticing the learner and considers her important, confirming the learner’s efforts, or improving rapport (Kato & Mynard, 2015). I chose these strategies based on things that my mentor and I had noticed in our meeting. First, we both felt that I was already effectively using basic advising strategies, such as restating and summarizing, and that I could push myself to focus on some more challenging ones. Additionally, my mentor pointed out that in the previous session, the discussion proceeded quite linearly, in that I would ask a question, Mari would answer, and I would then move on to the next question. Empathizing or complimenting would allow me to step in and include my own feedback to her answers, indicate that a topic was significant, and remain on that issue rather than letting it go. The strategies could also help us both handle Mari’s perceptions of experiencing less success than she had in the first module. Additionally, through complimenting, I could encourage her to focus on her achievements and feel positive about them. Finally, a goal of mine during the year had been to improve my global listening skills. Concentrating on finding the underlying message in students’ words to properly empathize with or compliment would help me develop those skills. In turn, this could also build positive rapport with the student by helping her feel that I was really listening to her. I also decided to focus on keeping a positive atmosphere in the session, particularly by improving my eye contact and smiling more, from observing the video of the earlier meeting. While mirroring is a valuable strategy in advising, I felt that I had been allowing the student to set the tone of the discussions and perhaps mirroring her too much. Thus, as Mari is serious about her learning and had been struggling to find success, my expression and the overall tone of the session became similarly serious. I also noticed moments in the video in which Mari would look at me after saying something, as if seeking confirmation or agreement, but I had missed those glances in the moment. These observations helped me recognize the influence that an advisor has in establishing the mood of a session. My peer mentor remarked that she always tries to maintain a slight smile in advising sessions and suggested that I could do the same. The 30-minute session was conducted in a semi-private advising space within the SALC. With permission from Mari, I recorded our meeting. Following the session, I watched the video and took notes on what I observed. In addition, I transcribed key parts of the session. My peer mentor also watched the video. We later met to discuss what we had noticed, which was highly valuable in helping me make my reflections stronger and more cohesive. In this session, I made a conscious effort to use empathizing and complimenting. I did not find it difficult or unnatural to do so; on the contrary, it felt satisfying. It seemed like I was really trying to go deeper, past my student’s surface statements, in order to find her true message. I feel that the strategies were effective in both highlighting Mari’s positive achievements and helping me listen deeply in order to find the right points to accentuate. Student (S): I like studying. I enjoy study. I want to study more, but in university, always, I have deadline. LA: So the deadline makes you feel like you have to do it. LA: So you can’t help it. That’s interesting. Yeah, it seems to me, I can see that you are really motivated. That you like, that you’re interested in your studying. But I understand that students, some things you have to do all the time. So often, I think, there’s kind of a, these two things are kind of fighting all the time. The things that you want to do and things that you have to do. But I think that you’re doing a really good job, that you’re trying to make the things interesting. Especially last semester, also, I think you did a really good job of using the materials and using learning which was interesting for you, and I think that you’ve been trying to find that this semester too. I know it’s not easy to balance everything, but I think that you’re trying really hard, and I think you’re doing a good job. S: Right now resources, is a good match for me. LA: Yeah, good. I know that you were not sure about your resource last time, so you found something which suits you better. You made an adjustment because you weren’t satisfied last time, so I think that was a good job, that you could make an adjustment to your plan. Nice. So you’re happier with your resource. In the above extract, the advising strategies allowed me to acknowledge her achievements, and I hope that in turn, she was also able to confirm them while also feeling that her efforts had been noticed. LA: And I think also, because you have a good idea for Time Management, to use your time and not be sleepy, if you can use those exercises or techniques well, then maybe you’ll be able to use your time to make the balance better. LA: But I agree, that you did a good job using your “Study” and “Use” time this month. LA: So I think you used your time very positively for those things. So which ones do you think you want to focus on for the next month? S: Hmm…Time Management and exercise. LA: Yeah, so you want to go out and exercise also. S: It can, it makes, it affects many things. S: Time management, SURE Balance, Motivation. LA: Yeah, I think you can see. You did a good job to notice that they’re all connected. I also feel, sometimes when I feel really sleepy, I have the same problem. And I think, sometimes I try to just drink coffee or tea, but at time, maybe the best thing for me is just to walk around the building and go for a short walk. It’s effective for me, too. LA: I know that you’re very busy, because you’re also majoring in another language, so you’re learning two languages. So to me, I can see that you want to do a lot of things at one time. Does it make a lot of pressure for you? LA: So you feel like you have to do something? nandarou? [“What is it?”] I feel, I have to, I have to… more… effectively and efficiently. I can’t do it now. I had taken a chance at intuiting that having many obligations was creating unpleasant pressure for her, but she was able to correct me and clarify that it actually motivated her. She could then express that her issue laid more in her dissatisfaction with not doing everything effectively. In this case, the strategy did not produce the expected outcome but led to a very helpful result. I also tried to keep a positive atmosphere in this session by focusing on making eye contact and maintaining a smile. As a result, the mood was better and much less tense than that of our previous meeting. Although this change could have been partly due to Mari having more positive results from that month, I believe that my efforts were successful. She was more animated than before and seemed much more engaged in our discussion. S: Now, if I, in this week, I finish all of things I have to do in this weekend, [gesturing] next week, something which I will have to do next week? So next week I can be free. And I can use that time for other things. So I want to do everything. LA: You mean you put it off until later? S: Yes. So it is my bad habit. LA: So when you try to think about the things you need to do, you put some things ‘til later? S: So, I, next Monday I will try, when I feel sleepy or tired, I exercise? LA: Right, yes, so you give up to your sleepiness. In these extracts, Mari smiled often and was quite animated, even almost playful, which is not a characteristic I would have associated with her in previous meetings. As an experiment, I watched the video without sound, and even then, it was clear from her body language and eye contact that she was actively invested in our conversation. Conversely, when Mari wanted to talk about more serious topics, I incorporated mirroring appropriately to reflect her feelings. Mirroring allowed me to listen to her earnestly without dragging down the mood of the session. Overall, I was satisfied with this session; I was moderately successful in using my target strategies and succeeded in maintaining a positive atmosphere. Having already become comfortable with some basic advising strategies, I was thus pleased at being able to push myself to use some different ones here, such as empathizing and complimenting. These strategies helped my student be aware of her positive achievements and were also useful in my becoming a more active listener. In terms of keeping a positive atmosphere, I was able to do so by improving my eye contact and smiling more. It seemed that this atmosphere helped Mari to actively reflect on her achievements and feel more positive about her self-directed learning. LA: What do you think is different from the last time that made [the Wheel of Language Learning] get so much bigger? S: I think… At that time, I didn’t do well all things, like deadline, I can’t save deadline, or I couldn’t finish what I decided. So, I was in…spiral? Bad spiral? Even though this was not my main focus in this session, it was gratifying to realize this growth in my advising skills. Using these questions was not something I had been working on explicitly, but it was something I wanted to be able to do effectively in my advising in the long term. It could be one of my strengths as an advisor, and it was nice to have this recognized by a colleague. Without the opportunity to reflect with a peer, I might have not have identified this aspect of my advising on my own. S: I feel, I have to, I have to… more… effectively and efficiently. I can’t do it now. S: I like studying. I enjoy study. I want to study more, but in university, always, I have deadline. S: But it is shoganai. Shoganai. When reflecting on these extracts, I felt that I let this point get away because I had been focusing on my own strategies while listening, thinking about the right way to respond, rather than immersing myself in what the student was saying. I could have explored what “effective and efficient” meant to her or challenged her to be more positive in her expectations for herself. There was also a missed opportunity to further discuss her feelings of having to do things and her perception of her obligations as “shoganai.” To her, these were likely important points to her that she was still struggling with. She used these terms multiple times, so she probably wanted to talk about them and express something to me. These areas might have escaped my attention at the time. I realize that having an explicit intent to use specific strategies is unnatural in advising, but it is also an inherent part of this type of observation. With time, I hope that as these strategies become more instinctive to me, I will be able to pick up on such points more naturally. S: I think… At that time, I didn’t do well all things, like deadline, I can’t save deadline, or I couldn’t finish what I decided. So, I was in… spiral? Bad spiral? LA: Ah, you were in a downward spiral. [gestures] Interesting. S: So, I feel down. But now, I have some trouble, some problems? But I can improve it. And I have improved from now, until now. It was a very meaningful achievement for her that semester, and I could have spent more time highlighting it and confirming its importance through complimenting. At the time, I remember stepping back and opting to let her direct the conversation, which soon shifted to another topic. My mentor helped me realize that at times like these, I can be more proactive in inserting my own feedback, as the point was worth emphasizing. I had tended to give students control of our sessions in order to avoid pushing my own agenda, but reflecting on this experience helped me notice that there are appropriate moments in which I can use my instincts to step in and offer input based on my professional experience. Additionally, my peer mentor remarked that in this session, Mari and I did not spend much time talking about her goals or her progress towards them. In this meeting and throughout the semester, I had felt that Mari had maintained a strong awareness of her goals, and we had both been satisfied with the connection between her learning plan and her goals. Her goal was to improve her TOEIC test score, and she was using materials specifically targeting the exam. As such, her activities were clearly relevant, particularly because she had changed from less directly related resources earlier in the semester. I did not directly raise the topics in this particular session, but I realized that in future meetings, it could be beneficial to review students’ goals and plans. Addressing these topics might help students regain focus on their goals or prompt reflection on their learning. Finally, I realized that I tended to rely on certain phrases in my feedback, particularly when complimenting (e.g., “Good job,” “Good work,” “Interesting”). I could use more varied phrases, more emphatic language to convey my sincerity, and language that is more specific to the student’s individual situation. My positive feedback might then feel more genuine to my advisees and thus be more effective (Kato & Mynard, 2015). My peer mentor had noticed that I often gave specific positive feedback in my written comments to students in the SALC learning course that we were team-teaching together. She suggested that it was something that I could do more of in my spoken advising. Following my reflection, the SALC director also viewed the video recording, read my observations, and gave her own feedback. She agreed with the things that I had noticed and offered suggestions for addressing the areas in which I want to improve. In particular, she commented that as I was already succeeding in the practical, language learning elements of advising, it might benefit me to explore the emotional aspect of advising more. For instance, because Mari was so serious in our meetings, I could have purposely directed the session toward the emotional facets to her learning through comments or questions. Since this observation, I have indeed started using positive feedback and talking about feelings more in my advising. I often find myself asking students about their emotional reactions to things that occur in their learning. In addition, as many of our learners come to us with problems or tend to focus on their perceived failures, I try to use the strategies discussed here, such as positive feedback that is specific to the learner, to help them recognize their positive achievements. These efforts have met with success; several students have commented that my advising helped them to feel better about their learning and realize their accomplishments. It was also especially rewarding that Mari, in her reflective final report for the module, specifically identified my support as a factor in her increased satisfaction with her learning. Also, in advising sessions, I have been able to maintain a lighter, positive atmosphere more consistently, through the effective use of humor, personal anecdotes, and drawings. These developments in my advising felt quite natural to me, and seeing the positive outcomes reassured me that I am heading in the right direction. For my further professional development, I also followed up on suggestions from the SALC director that I could learn more about positive feedback and emotional factors and, in doing so, have recently become interested in positive psychology and its relevance in language learning. This expansion of my professional interests has come about through exploring the relevant literature, attending presentations, and taking an online course. It remains to be seen whether this will develop into a long-term research interest, but what I learn will undoubtedly be of practical use in my advising. This observation was just one aspect of professional development for learning advisors in the SALC, but it was an immensely valuable experience. It allowed me to reflect on my strengths as an advisor, what I still needed to improve, and the progress that I had made in the transition from teaching to advising. With the busy daily schedule of a learning advisor, I might have overlooked these insights without the gentle push to reflect that was given by this observation. The observation also supplied the impetus to explore different strategies in my advising; without it, it might have been easy to continue at a comfortable but low-risk pace, potentially becoming stagnant. I recognize the importance to my continued growth of regularly taking time to reflect on my practices. Finally, this process would not have been nearly as fruitful without input from others. Collaborating with my mentor and director revealed new things and deepened my own reflection; my colleagues will continue to be invaluable parts of my professional progress. While the observations I have recorded here draw from my own specific situation, I hope that they provide an example of the potential that reflective observation has in aiding the development of an advisor. Isra Wongsarnpigoon is a learning advisor at Kanda University of International Studies. He holds an M.S.Ed. from Temple University, Japan Campus and has worked in English education in Japan since 2004. Kato, S., & Mynard, K. (2015). Reflective dialogue: Advising in language learning. New York. NY: Routledge. I enjoyed very much reading your reflection. It was really a pleasure to see how deep you have been looking into your own behaviour and discourse as a learning advisor and how you make it to the starting point for your further development. Many of the aspects you mention in your article resonate with me. Yes, the transition from teaching to advising is both challenging and exciting even for experienced advisors. I started advising more than ten years ago, and I still have moments in my advising sessions in which I have to silence the “teacher in me”. By the way, I find advising much more rewarding than teaching. And yes, the emotional and personal relationship between learner and advisor is very complex and need attention and sensibility. In your reflection you focus on two essential strategies, empathizing and complimenting. Your analysis of the advising session with Mari shows how these strategies are linked to others, such as deepening one’s listening skills, being also able to go “past the surface” of learners’ statements, identify and address both cognitive and affective aspects of the learning process. I think your analysis goes very deep and uncover the core of learning advising as an encounter of learner and advisor as persons. You are also aware of the need to find a balance in the advising session, for example between mirroring and not mirroring too much. In my experience, every advising session is a new experience in which we learn, we make mistakes, we succeed in a dynamic, ongoing process. You have the wonderful opportunity to share your reflections with a mentor and with other colleagues. This is a real asset and an enrichment and in your text it is clear that you make the best out of it. You write you have become interested in positive psychology. There is a book with many contributions of authors I have been reading or listening to at conferences, which could maybe be interesting for you: Gabryś-Barker, D., & Gałajda, D. (Eds.) (2016). Positive psychology perspectives on foreign language teaching and learning. Springer. To conclude, I would like to thank you for sharing your reflections. I am sure, you will go far, and I hope we can meet again and share our questions and progresses along the way. I am glad that this review process provides the opportunity to engage in dialogue with peers who may have similar experiences and to learn about their experiences in turn. I suppose it should be expected that anyone with a teaching background will have challenges in the transition to advising, yet it is still helpful and comforting to know that there are others who understand this process—and also that I do not have to be concerned if the transition is not exactly smooth. As you wrote, the advisor-advisee relationship is very complex. Interpreting and reacting to the dynamic between myself and individual advisees can be challenging yet also, as you mentioned, I have found these interactions to be incredibly rewarding. I also appreciate your comprehensive analysis of my reflection, as it helped me step back and look at the bigger picture of which aspects I had focused on. Seeking a balance in various areas (e.g., in the use of advising skills, in the advisor’s and advisee’s roles) was a significant point in my reflection here, and it continues to be highly important in my development as an advisor. I agree that each advising session brings us a new opportunity to explore these various balances, which I am appreciating more in my second year as an advisor (rather than always worrying about trying to “get it right”). I especially liked your description of each session as a “dynamic, ongoing process.” I hope to approach my advising—particularly more difficult sessions—from this viewpoint from now on. Thank you again for taking the time to share your thoughts and experiences. I too look forward to discussing these issues again at some point. I really enjoyed this reflection on your professional development. What struck me is the importance of having a supportive group of colleagues, with a semi-formal peer support process, to develop effectively. In your concluding sentence you mention that your findings may be of interest to advisors in other settings; I would argue that your experience would be relevant beyond our field and be of interest to educators in a wider variety of settings. Your description of at first over-using advising strategies, and then attempting to develop your own advising style which is ‘instinctive’ and ‘natural’ definitely resonates with my own experience of becoming a learning advisor. The technique of applying what was working in written advising to your spoken advising is also something I have tried to do. I think you might enjoy reading Shelley, M., Murphy, L & White, C. J. (2013). Language teacher development in a narrative frame: The transition from classroom to distance and blended settings. System, 41(3), pp. 560-574. This paper looks at transitioning from being a classroom-based language teacher to teaching online so I think there is some crossover. In your abstract, you wrote that ‘the session was more positive than previous ones’, which suggests you are/were some way from being satisfied. What would the perfect advising session with Mari look like? (I’m also intrigued whether you’re still working with her). Finally, thank you for reminding me of the importance of acknowledging student achievements, talking about feedback, and picking up on repeated words during advising sessions. Thank you for your valuable feedback, Huw. Upon further thought, I agree with your observation that my experiences could be helpful to educators in many contexts, not just advisors or language teachers. The skills that we use, the dynamic that we maintain with learners, as well as the reflection that we ourselves engage in could all be potential aspects of practice for people who work with students to consider. As you pointed out, we are fortunate to be in a context that provides active support for these areas. As you pointed out, it is natural that we go through a process of finding our own personal advising styles, and having this supportive environment really facilitates that process. Your question gave me quite a lot to think about. As I wrote in the paper, in an ideal session, I would have picked up on cues regarding key issues more naturally in the moment and been able to take advantage of those moments to slow things down and focus on those points. Thinking about my answer to your question, though, did help remind me that it is unrealistic to expect a perfect session and to be satisfied with the things that I was able to achieve. Incidentally, I have not worked much with Mari this academic year, although I always enjoy chatting with her around campus. She was already quite a self-directed learner, so I believe that she was satisfied to find a learning style that worked for her and continue using what she learned in our modules. Also, it seems that she has been focusing more on her (non-English) major language. Judging from her reflections in the modules and in her final report, however, I feel confident that she is comfortable coming back for help and support when needed. Thank you again for providing me with additional insight, and I am glad that my paper also helped you reflect on your own experiences.